Have you given much thought to your kidneys lately? These powerful organs regulate your body’s fluid levels, filter toxins from the blood, help in the production of red blood cells and much more – all in a matter of seconds. Blood filtering: Because kidneys serve as your body’s main filtration system, blood flow through these organs is higher than in the heart, liver and brain. In one hour, approximately 120 pints of blood reach your kidneys and they filter your entire blood stream nearly 400 times a day. Vitamin D: Kidneys frequently activate vitamin D in your body, essential for healthy bone development. Healthy kidneys can help you avoid the negative side effects of a vitamin D deficiency such as fatigue or muscle weakness. Waste removal: Kidneys contain millions of nephrons that regulate the body’s water concentration. These help manage your body’s salt, acid and potassium levels to remove toxins and waste. Functionality: You may know that your body can function with just one kidney, but the sheer power of these organs might surprise you. 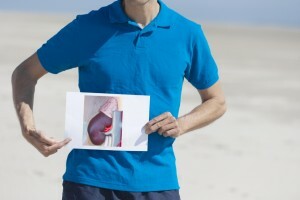 Even if a lone kidney has a reduced functionality of 75 percent, it can still sustain life. This is possible because the nephrons are capable of enlarging to deal with added stress. Disease: A healthy kidney is a powerful thing, but it’s still susceptible to disease. In fact, kidney disease is the ninth leading cause of death in the U.S. The ailment frequently has little to no symptoms, meaning many people can have it without even knowing. High blood pressure and diabetes are the two leading causes of kidney disease. Prevention: In addition to screening your blood and urine to check for proper kidney function, people of all ages can take preventative steps to lower their risk of kidney disease. By reducing salt intake, moderating protein consumption, exercising regularly, avoiding smoking and staying hydrated, you’re more likely to have healthy kidneys – especially if you’re over the age of 60. If you want healthier kidneys for you and your loved ones, it’s important to take advantage of the National Kidney Foundation’s free screenings for at-risk individuals throughout March. If you want to learn more about managing kidney health, especially for your aging loved ones, contact your local FirstLight Home Care today. Our caregivers are specially trained to manage the health of seniors and other at-risk adults wherever they call home.